Product prices and availability are accurate as of 2019-04-19 03:02:20 UTC and are subject to change. Any price and availability information displayed on http://www.amazon.co.uk/ at the time of purchase will apply to the purchase of this product. The Anxiety Coat was designed to feel like safety blankets, but for dogs. This jacket is an incredible training tool that is snug and comfortable and designed to increase the effectiveness of treating noise anxiety. There are various sizes, so please check the guide on finding the right fit for your dog! With its patent-pending design, Thundershirts gentle, constant pressure has a dramatic calming effect for most dogs if they are anxious, fearful or over-excited. Based on surveys completed by over two thousand customers, over 80% of dogs show significant improvement in symptoms when using Thundershirt. Thundershirt is already helping tens of thousands of dogs around the world, and is recommended by thousands of veterinarians and dog trainers. Size Chest Size Weight XXS 9"-13.5" < 7 lbs. XS 13"-18" 8-14 lbs. S 16"-23" 15-25 lbs. M 18"-26" 26-40 lbs. L 24"-32" 41-64 lbs. XL 31"-40" 65-110 lbs. 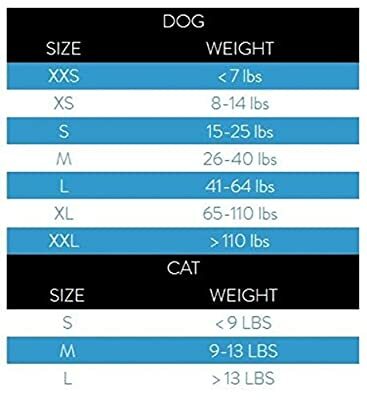 XXL 38"-50" > 110 lbs.